For patients who have ESRD and receive hemodialysis (HD) treatment, a well-functioning vascular access is necessary for achieving adequate dialysis and improving the quality of life. Among several types of vascular access, the long-term technical survival is best for the native arteriovenous fistula (AVF), which accounts for more than 80% of vascular access in HD patients in Taiwan. Vascular access complications accounted for approximately 20% of HD patient hospitalizations in the United States with a cost of $1 billion annually (1). Malfunction of vascular access usually presents with inadequate blood flow because of stenosis or thrombosis of the venous outflow tract (2). Approximately 80 to 85% of AV access failures arise from AV access thromboses, more than 80% of which result from AVF stenoses (3). An access flow (Qa), <500 ml/min was associated with an increased risk for access failure and predictive of poorer unassisted patency of native AVF (4). The pathologic features of stenosis of vascular access are composed of intimal hyperplasia, proliferation of smooth muscle cells in the media with subsequent migration to intima, and excessive accumulation of extracellular matrix (5). Despite these findings, little information is available on how to prevent effectively the stenoses of vascular access in HD patients. Infrared radiation is an invisible electromagnetic wave with a longer wavelength than that of visible light. According to the difference in wavelength, infrared radiation can be divided into three categories: Near-infrared radiation (0.8 to 1.5 μm), middle-infrared radiation (1.5 to 5.6 μm), and far-infrared (FIR) radiation (5.6 to 1000 μm) (6). Infrared radiation transfers energy that is perceived as heat by thermoreceptors in the surrounding skin (7). The application of FIR radiation includes food preservation (8) and health promotion (9–10). Animal studies also demonstrated that FIR improves skin blood flow (11,12), leading to the use of FIR in the treatment of ischemic lesions and necrosis of skin tissue as a result of trauma, diabetes, and peripheral arterial occlusive disease. In addition, some studies indicated that FIR therapy may improve endothelial function and reduce the frequency of some cardiovascular diseases (13–15). Because vascular access usually is located in the superficial site of the upper extremities of HD patients, FIR therapy may be considered as an alternative therapeutic modality for improving access flow and the function of the AVF. The objective of this study was to evaluate the effect of FIR on access flow and patency of AVF in HD patients. In this study, we included patients who met the following criteria: (1) Receiving 4 h of maintenance HD therapy three times weekly for at least 6 mo at Taipei Veterans General Hospital; (2) using a native AVF as the current vascular access for more than 6 mo, without interventions within the last 3 mo; and (3) creation of AVF by cardiovascular surgeons in our hospital with the standardized surgical procedures of venous end-to-arterial side anastomosis in the upper extremity. All patients were receiving dialysis three times weekly on standard bicarbonate dialysate bath (38 mEq/L HCO3−, 3.0 mEq/L Ca2+, and 2.0 mEq/L K+), using the volumetric-controlled dialysis delivery system under constant dialysate flow at 500 ml/min. Patients were anticoagulated by means of systemic heparin, without change of the individual bolus or maintenance dosage throughout the study. This study is a prospective, randomized, controlled trial. The study was based on the Helsinki Declaration (edition 6, revised 2000 ) and was approved by the Institutional Research Board of Taipei Veterans General Hospital. In addition, it was registered at the Cochrane Renal Group registry. After informed consent was obtained from every study participant, the patients were randomly allocated to either the FIR group or the control group by means of a computerized minimization algorithm to ensure balance between the two groups with respect to history of AVF malfunction. The participant allocations were concealed from investigators by the computerized minimization algorithm, and the allocation sequence was kept by a study nurse (Cherng-Fung Hung), who would not tell the investigator the participant allocation until the time of intervention. We recorded the following clinical factors: Age, gender, HD therapy duration, underlying cause of ESRD (presence or absence of diabetic nephropathy), and time of AVF malfunction. The primary end point was the survival time of the AVF with unassisted patency, which was defined as the time from the commencement of the study to the first episode of AVF malfunction. We defined AVF malfunction as the need for any interventional procedure (surgery or angioplasty) to correct an occlusive or malfunctioning AVF that cannot sustain an extracorporeal blood flow >200 ml/min during HD after exclusion of the following stenosis-unrelated events: Infectious complication, progressive aneurysmal formation, or steal syndrome. We also measured the hemodynamic parameters according to the following procedures. The access flow (Qa), cardiac output (CO), and total peripheral resistance were measured during HD by the ultrasound dilution method using the Transonic HD02 hemodialysis monitor (Transonic Systems, Ithaca, NY). The technique is used widely and extensively validated in the literature (17). In brief, the technique uses two ultrasound sensors that are attached to the two HD tubing lines, one to the arterial and the other to the venous catheters, approximately 3 to 5 in from the connection of the tubing to the dialysis needles. Initially, tubing lines are reversed, and ultrafiltration is turned off. A measured bolus of saline (10 ml) is injected into the venous catheter, resulting in changes in sound velocity that are measured by the transducers on the catheters. This change then is calculated by the Transonic software, giving the result of Qa (ml/min). If Qa could not be obtained by this method, then it would be measured by the variable pump flow–based Doppler ultrasound method (4). The CO can be measured by injection of 30 ml of saline (37°C) into the venous catheter without reversing the tubing lines. Total peripheral resistance can be calculated by computer software by dividing the mean arterial BP by the CO. All of these hemodynamic parameters were measured twice. When the difference between them was more than 10%, a third measurement was done. The mean of the two closest values was recorded into our database. In this study, a WS TY101 FIR emitter (WS Far Infrared Medical Technology Co., Ltd., Taipei, Taiwan) was used for FIR therapy. The electrified ceramic plates of this emitter generate electromagnetic waves with wavelengths in the range between 5 and 12 μm (a peak at 8.2 μm). The top radiator was set at a height of 25 cm above the surface of the AVF with the treatment time set at 40 min during HD three times per week. Effect of FIR Therapy on the Hemodynamic Parameters of HD Patients in a Single HD Session. The study participants were randomly divided into the treatment and the control groups. The measurement of Qa and other hemodynamic parameters, including CO, total peripheral resistance, and BP, etc., were recorded in patients at two different time points: Time 1 at the beginning of an HD session and time 2 at 40 min after time 1. One week later, the same parameters were measured in patients immediately before and after 40 min of FIR therapy at the beginning of another HD session. 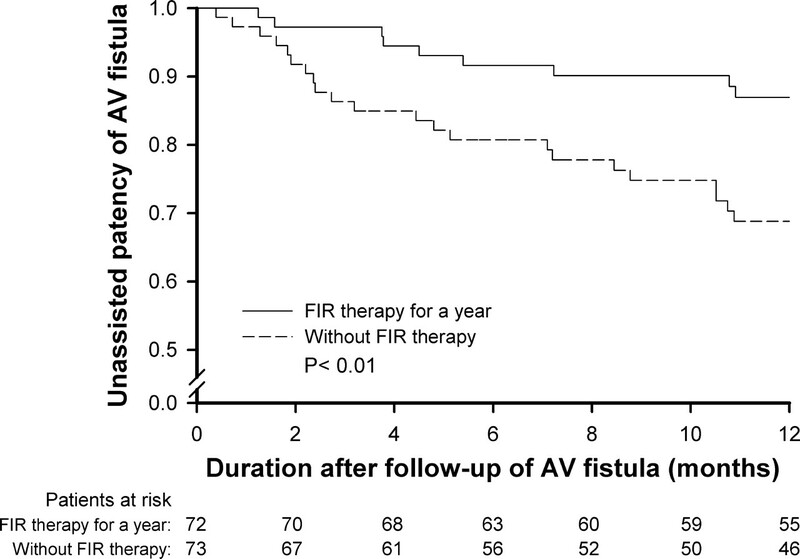 Effect of 1 Yr of FIR Therapy on Access Flow and Unassisted Patency of the AVF in HD Patients. Every hemodynamic parameter was measured at four different times in the study patients when they had received HD by the same AVF when they completed this study. In the control group, we defined time 1 as the time point at the beginning of the HD session immediately before the commencement of this study, time 2 as the time point at 40 min after time 1, time 3 as that at the beginning of the HD session when the study was completed, and time 4 as that at 40 min after time 3. In the treatment group, times 1 through 4 were defined the same as that in the control group except that time 3 was that immediately before and time 4 was that immediately after FIR treatment during the HD session when the study was completed. For example, Qa1 indicates access flow measured at time 1, Qa2 at time 2, Qa3 at time 3, and Qa4 at time 4. Only the treatment group received 40 min of FIR therapy in every HD session for 1 yr. During the 1-yr follow-up, patients would be excluded from the study because of the following censoring criterion: Renal transplantation, death with a functioning access, shifting to peritoneal dialysis, or loss of follow-up. Data management and statistical analysis were done using the SPSS statistical software (version 11.0; Chicago, IL). Distributions of continuous variables in groups were expressed as mean ± SD and compared by t test. All data were tested for normal distribution before using t test. Categorical variables, such as the frequency of AVF malfunction in the treatment group and control subjects, were analyzed by χ2 test. The 95% confidence interval for every variable also was calculated. Survival curves of unassisted patency of AVF were calculated by the Kaplan-Meier method and compared by the log rank test. A statistically significant value was P < 0.05. As shown in Figure 1, a total of 145 patients were enrolled in the study. Among them, 73 patients were randomly distributed to the control group and 72 patients to the FIR treatment group. As listed in Table 1, there was no difference in the demographic and clinical characteristics between the two groups of HD patients. During follow-up, one patient receiving FIR therapy and four patients in the control group underwent creation of another vascular access because of the poor response to angioplasty. In addition, patients were censored at the time of renal transplantation (n = 3), death with a functioning access (n = 5), shifting to peritoneal dialysis (n = 4), or loss of follow-up (n = 1). This study was terminated on December 31, 2005. Finally, 127 patients completed the study with 64 patients in the control group and 63 patients in the FIR treatment group. As shown in Table 2, there was no significant difference in most of the hemodynamic parameters (e.g., BP, CO, total peripheral resistance) between the single HD session with or without FIR treatment for the 72 HD patients. However, the incremental change of access flow [Δ(Qa2 − Qa1)] of these patients in the single HD session with FIR therapy was significantly higher than that without FIR therapy (13.2 ± 114.7 versus −33.4 ± 132.3 ml/min; P = 0.021). In comparison with control subjects, the HD patients who received FIR treatment three times per week for 1 yr had higher incremental values of the following changes of access flow regarding both the initial and final HD sessions: (1) Δ(Qa4 − Qa3) (36.2 ± 82.4 versus −12.7 ± 153.6 ml/min; P = 0.027), (2) Δ(Qa3 − Qa1) (36.3 ± 166.2 versus −51.7 ± 283.1 ml/min; P = 0.035), (3) Δ(Qa4 − Qa2) (99.2 ± 144.4 versus −47.5 ± 244.5 ml/min; P < 0.001), and (4) Δ(Qa4 − Qa2) − Δ(Qa3 − Qa1) (ml/min; 62.9 ± 111.6 versus 4.1 ± 184.5 ml/min; P = 0.032). As shown in Table 3, these results still are significant even after they are normalized to CO. As listed in Table 2, the FIR group had a lower incidence of AVF malfunction (12.5% [nine of 72] versus 30.1% [22 of 73]; P < 0.01). Some patients experienced multiple episodes of AVF malfunction during this study, so relative incidences of AVF malfunction (number of incidences per patient months of follow-up) were calculated. The relative incidence of AVF malfunction in the FIR group (one episode per 67.7 patient-months) was significantly lower than that in the control group (one episode per 26.7 patient-months; P = 0.03; Table 2). 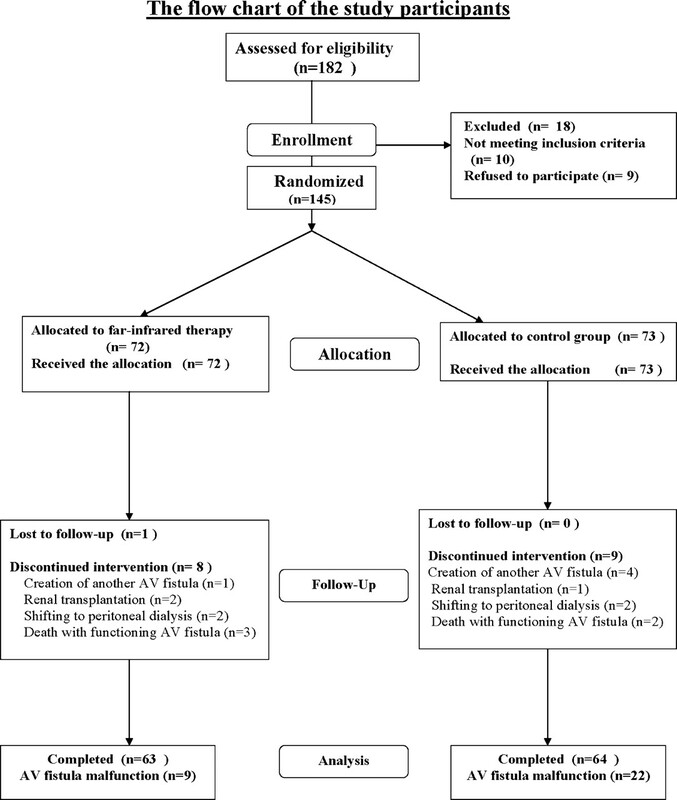 We evaluated the effect of FIR therapy on vascular access survival in all of the initially included 145 HD patients (72 with FIR and 73 control subjects) in this study. Among them, eight patients in the FIR group and five patients in the control group were censored because of reasons other than AVF malfunction, such as renal transplantation, death with a functioning access, switching to peritoneal dialysis, and loss to follow-up (Table 1). Consequently, the expected patient numbers that are used as the denominator for calculation of the unassisted patency of AVF should be 64 for the FIR group and 68 for the control group. As shown in Figure 2, the unassisted patency of AVF at 1 yr was significantly better in the FIR group than in the control group (85.9% [55 of 64] versus 67.6% [46 of 68]; P < 0.01 by Log rank test). Concerning the safety issue of FIR therapy, no patient complained of any adverse effect, such as skin burn or allergy to the FIR therapy, throughout the whole course of the study. FIR is an electromagnetic wave with wavelengths that range from 5.6 to 1000 μm. The technology of FIR has been applied widely in a variety of fields. Our study demonstrated the effect of FIR therapy on (1) increasing the incremental change of Qa both in a single HD session and after a 1-yr treatment course and (2) improving the survival of AVF in HD patients after treatment for 1 yr. We use the incremental changes of Qa in this study for two reasons. First, we would like to control the interfering effect of the great individual variation in flow. This may explain why there was no statistical significance for Qa4 even with a difference of 119.4 ml/min between the two groups but there was significance for Δ(Qa4 − Qa3) with only a difference of 48.9 ml/min in Table 3. Second, several incremental changes of Qa were helpful to quantify and elucidate the roles of the various effects (e.g., hemodynamic effect of HD, the thermal and nonthermal effects of FIR) in the change of access flow. Δ(Qa4 − Qa3) represents the sum of the thermal effect by FIR and the hemodynamic effect by HD on the change of Qa because Qa4 was measured after Qa3 by 40 min, during which time both FIR therapy and HD were received by the patients. Δ(Qa3 − Qa1) stands for the nonthermal effect of 1 yr of FIR on the change of Qa because the two parameters were measured in the beginning of the two HD sessions 1 yr apart. Δ(Qa4 − Qa2) indicates the sum of the thermal effect (for 40 min) and the nonthermal effect (for 1 yr) by FIR on the change of Qa. [Δ(Qa4 − Qa2) − Δ(Qa3 − Qa1)] represents the thermal effect of 40 min of FIR on the change of Qa because it is the difference between Δ(Qa4 − Qa2) and Δ(Qa3 − Qa1), which were mentioned previously. Our results supported that both the thermal and the nonthermal effects of FIR can increase the access flow. Moreover, there is an additive benefit of both effects because Δ(Qa4 − Qa2) was the item with the greatest difference (99.2 ± 144.4 for FIR group versus −47.5 ± 244.5 ml/min for control group; P < 0.001). To correct for the influence of CO to access flow, the normalization of Qa/CO was done for each individual flow reading, and this number then was used for further analysis. After normalization, all of the indices of the previously mentioned incremental change of Qa attain statistical significance. The thermal effect of FIR results in vasodilation and increasing Qa. According to the report by Vaupel et al. (18), the temperature can be increased up to 4°C in 10-mm depth of tissue. In addition, infrared therapy may allow multiple energy transfer as deep as 2 to 3 cm into subcutaneous tissue without irritating or overheating the skin like unfiltered heat radiation (19). The skin temperature steadily increased to a plateau at approximately 38 to 39°C during the treatment of FIR for 30 to 60 min as long as the distance between the ceramic plate and the skin was >20 cm (11). Therefore, infrared therapy can be free of the disadvantages or adverse effects (e.g., burn injury, infection, risk for access failure, prolonged bleeding from the previous venipuncture site) of some traditional methods of thermal therapy. This may explain why these complications did not develop in our patients during this study. In addition to the thermal effect, the increase in both the access flow and AVF patency in this study may result from nonthermal effects of infrared therapy. In particular, FIR may improve endothelial function, which is observed not only in animal studies (11,12,14) but also in one clinical study (13). Yu et al. (11) suggested that the beneficial effect of FIR therapy on skin blood flow may be related to the l-arginine/nitric oxide (NO) pathway. In this respect, Akasaki et al. (12) found that repeated FIR therapy could upregulate endothelial NO synthase (eNOS) expression and augment angiogenesis in an apolipoprotein E–deficient mouse model of unilateral hind limb ischemia. Moreover, Ikeda et al. (14) reported that 4 wk of sauna therapy significantly increased the serum nitrate concentrations as well as the expression of mRNA and protein of eNOS in the aortas of TO-2 hamsters. In addition, Imamura et al. (13) showed that 2 wk of repeated sauna therapy significantly improved vascular endothelial function, resulting in an increase in flow-mediated, endothelium-dependent dilation of the brachial artery from 4 to 5.8% in patients with coronary risk factors. Besides activating eNOS expression, inhibiting neointimal hyperplasia and decreasing oxidative stress are two other nonthermal effects of FIR therapy. Kipshidze et al. (20) found that nonablative infrared laser (NIL) therapy inhibited neointimal hyperplasia after percutaneous transluminal coronary angioplasty in cholesterol-fed rabbits for up to 60 d. According to their report, the nonablative doses of NIL decreased the growth of vascular smooth muscle cells (VSMC), but it did not decrease the growth rate of endothelial cells. Because the proliferation of VSMC in the media is an important pathologic finding of the vascular wall of HD patients with vascular access stenosis (5), slowing the growth of VSMC may reduce the frequency of access stenosis. According to the report by Masuda et al. (21), systolic BP and the increased urinary 8-epi-prostaglandin F2α levels were significantly lower in the patients who received a FIR dry sauna for 45 min/d for 2 wk. F2-isoprostanes, namely 8-epi-prostaglandin F2α, are chemically stable products of lipid peroxidation, and the level has been suggested as a reliable marker of oxidative stress in vivo (22). These results suggest that repeated sauna therapy may reduce oxidative stress, which leads to protection against the progression and complications of atherosclerosis. Because HD patients also are exposed to heavy oxidative stress from both inward uremic status and outward HD-related technology, the application of FIR therapy may be considered as an alternative therapeutic modality for decreasing oxidative stress. Apart from the previously mentioned nonthermal mechanisms (improving endothelial function, inhibiting neointimal hyperplasia, and lowering the level of oxidative stress), one possible explanation for the higher unassisted patency of AVF in our patients may be an increase of the access flow after 1 yr of FIR therapy. The access flow is an important parameter for predicting the prognosis of vascular access. A shorter survival of vascular access was associated with a lower value of Qa or a significant decrease from the previous Qa within a period. According to Kidney Disease Outcomes Quality Initiative guidelines for vascular access, HD patients with Qa <600 ml/min or Qa <1000 ml/min that has decreased by >25% during 4 mo should be referred for fistulogram to detect potential stenotic lesions (23). Our previous study found that the unassisted patency of vascular access at 6 mo was significantly poorer in patients with Qa <500 ml/min than in those with Qa >500 ml/min (13.6 versus 92.2%) (4). Therefore, the increase of Qa may contribute to the higher patency of AVF of our patients in this study. As to the limitation of this study, the result should not be extrapolated to HD patients who use AV graft as their vascular access because we included only patients with AVF. Moreover, this study was not done in patients with new AVF but rather in a group of patients with preexisting AVF. Although we randomly assigned our study patients by controlling for many possible factors, individual variation of vascular condition still could influence the final result. Therefore, it is necessary to perform a large-scale, prospective, randomized, controlled trial to evaluate the effect of FIR therapy on the primary unassisted patency of the de novo AVF that is created in HD patients in the future. Although the precise mechanisms for the beneficial effects of FIR still need further investigation, the better unassisted patency of AVF after 1 yr of FIR therapy may result from the increase of Qa, which could be associated with both thermal effect–induced vasodilation and nonthermal effects of inhibiting intimal hyperplasia as well as improving endothelial dysfunction by enhancing the activity of eNOS and/or lowering the level of oxidative stress. Our study provides evidence that FIR therapy, a convenient and noninvasive technology, may be an effective therapeutic modality in improving access flow and patency of the AVF in HD patients. This work was supported by grant NSC 95-2314-B-075-070 from the National Science Council and grant V95-ER2-003 from Taipei Veterans General Hospital in Taiwan. We thank the clinicians who referred the patients and collected blood samples: Dr. Yee-Yung Ng, Dr. Tsai-Hun Wu, Dr. Der-Cherng Tarng, Dr. Jinn-Yang Chen, Dr. Yao-Ping Lin, and Dr. Chiao-Lin Chuang at Taipei Veterans General Hospital. We thank Professor William Durante at the University of Missouri for help in corrections in English. We also thank Cheng-Fang Hong for technical support.